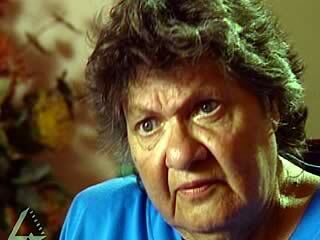 Video clip synopsis – Indigenous people, particularly those from remote communities, fear seeking medical attention. Joan Winch, an Indigenous health professional, set up a health worker training college for Indigenous health workers. Broadband MP4 winch_bb.mp4 (5.6MB), suitable for iPods and computer downloads. Indigenous Health Workers is an excerpt from the program Joan Winch (26 mins), an episode of Australian Biography Series 9 (7 × 26 minutes), produced in 2003. Joan Winch: Nurse, midwife, academic, educator… Joan Winch has overcome numerous professional and personal hurdles to make an extraordinary contribution to Aboriginal health. The innovative and internationally acclaimed education programs that she has established focus on preventative and holistic medicine and community participation, integrating Indigenous practices and values. In this interview, she talks about her work and philosophies, the discrimination experienced by her family and her people, and her own journey from isolation and loss to a sense of purpose and spiritual awakening. Australian Biography Series 9: The Australian Biography series profiles some of the most extraordinary Australians of our time. Many have had a major impact on the nation’s cultural, political and social life. All are remarkable and inspiring people who have reached a stage in their lives where they can look back and reflect. Through revealing in-depth interviews, they share their stories – of beginnings and challenges, landmarks and turning points. In so doing, they provide us with an invaluable archival record and a unique perspective on the roads we, as a country, have travelled. Australian Biography Series 9 is a Film Australia National Interest Program. State the Aboriginal term Joan Winch uses for “good hands”. Define and explain what the concept “good hands” means in relation to being a health worker in the Indigenous community. Give examples of where you think this is shown, visually, during the video clip. List the reasons Joan Winch gives to explain why Aboriginal people may be afraid or suspicious of non-Indigenous health services. Imagine that Joan Winch is coming to visit your class. You can ask her five questions. What will they be? In pairs research and prepare a biography of the life work of Joan Winch in Indigenous health care. You may do this either in the form of a magazine article presented in text and illustrations, using desktop publishing software, or as one or more internet web pages that could be placed on your school’s intranet. Discuss in class the possibilities for design and content, then plan and construct a recruitment wall poster designed for the Careers Information section of your school, aimed at attracting candidates for training as a health worker in Indigenous communities. Write your own short fiction story, or plan your story and tell it orally to the class, about a health worker servicing a remote Indigenous community.